margaret atkinson on Take A Close Look! Craig Urban on Can You Name Them All? 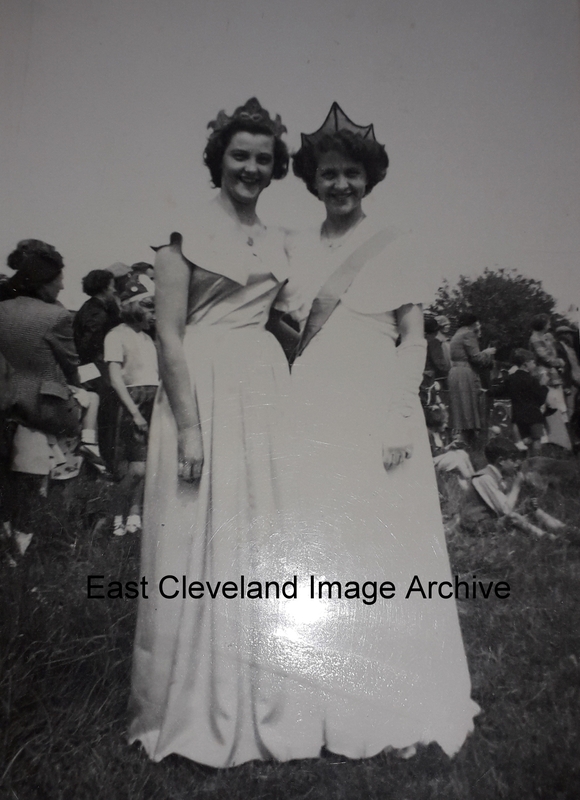 In 1953, Carlin How held a Carnival to celebrate following the Coronation of Queen Elizabeth II; pictured we have Coronation Queen Ann Seymour (on the right with the sash) and her attendant and friend Moira Smith . The event was held on the football field near The Bullet on Kilton Lane. Ann tells the Archive: “I went to school with Moira’s brother, Derek Smith. I would love to hear from anyone who remembers Moira and Derek, or if anyone remembers this carnival”. Image and details courtesy of Ann Robinson. I remember it, I also remember Derek, Moira’s brother. Derek moved to Stanghow Road on the outskirts of Lingdale, many years ago. A lovely lad but sadly Derek passed away in recent years and one of his children too. His wife is still here. Good memories of them all. Derek will be remembered by many as he made regular attendance at Carlin How Workingmens Club. I lost track of where Moira went some years ago so can’t help there. Thanks for the reply Derick. That’s sad about Derek and one of his children. It makes you wish you kept in touch with people doesn’t it. No luck with any info on Moira from anyone either. Tom married my Mam Joyce in 1980. Sadly Tom passed away in January 2016 and; my Mam who worked at Carlin How club for nearly 50 years also died in December 2018. Moria married David Hart and they moved to Redcar many, many years ago, they used to breed Shelties and long haired Collies. Moria also passed away about six years ago but Pam Smith (now White) is still very much alive and still in Carlin How. Hope that helps. Thanks for all the amazing info on here, I’ve been trying to find out when Maynard Street was built and have been able to piece it together now. It’s all really interesting. Anthony came to Mam’s funeral, even tho we hadn’t seen much of each other for years with us getting married and moving away – he is a true gent. Hi Dianne. Many thanks for reply. We always wish we could have done this years ago don’t we. ? I lived in Carlin How all my young life and have happy memories of that time. Have lived in Redcar for the last 40 years. Thanks again. Herbert Hassack and Ruby Penrose? Fancy Dress at Carlin How Club Hall 1950? Music Hall Act Or What?